The Funky Felter: Funky Felter Woolly Fiber Batts for Felting and Spinning now available in my Etsy Fiber Shop with more to come! 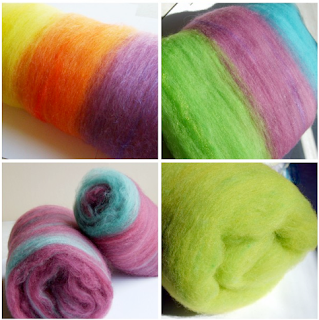 Funky Felter Woolly Fiber Batts for Felting and Spinning now available in my Etsy Fiber Shop with more to come! I'm having a blast carding batts on my new drum carder! Making colorful wool batts is really a fiber art form in itself. Although I am definitely keeping some of my yummy, yummy batts for felting and spinning, I am also selling some of them in my Etsy Fiber Shop. 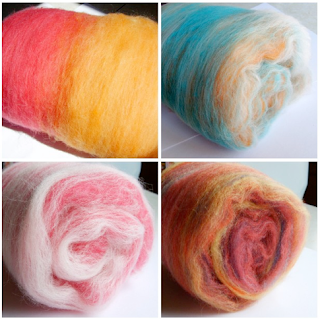 I have listed a few woolly batts today and will continue to list many more for sale in the coming days. I hand dye most of the fiber for my batts as well as card them several times. My batts are soft and smooth and ideal for the feltmaker or spinner. Since I am a fiber addict artist myself, I always make my batts with the fiber artist in mind! Very pretty, I especially like the blue with the apricot? peaking through-it shows the softness of your layers. Pretty colours. Isn't it great to mix up colours. Oh, Shalana, I love your batts, marvelous! I'll be purchasing some slln.